Roy E. Disney, the nephew of Walt Disney who became a powerful behind-the-scenes influence on the family business, has died from cancer at the age of 79. 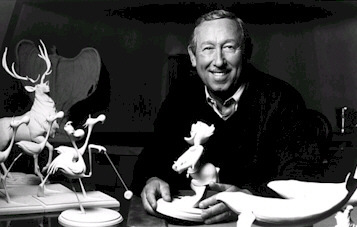 Roy was born in 1930 and worked for the company as a writer and producer. However his most important influence was as a Disney shareholder who led two investor revolts. Disney, who had been battling stomach cancer, died at Hoag Memorial Hospital Presbyterian in Newport Beach, according to Clifford A. Miller, a spokesman for Disney’s company Shamrock Holdings. John Frost of The Disney Blog points out that rumors of his declining health had been swirling for the last few years since he stepped back from his joy – yacht racing. He adds that only recently, since his absence at the dedication of the Walt Disney Family Museum, have the rumors grown more serious. Roy toiled for years in the shadow of his famous uncle and his father, Roy O. Disney. However the quiet man in the cardigan sweater often lovingly referred to as “that darn nephew” would emerge as a forceful protector of family traditions. In 1984 he led a successful campaign to oust Walt Disney’s son-in-law, Ron Miller, from the company. Nearly 20 years later, he launched another successful shareholder revolt against Michael Eisner. At both times Roy was extremely upset at the direction (or lack thereof) that the company was headed in. James Bates and Dawn C. Chmielewski of The L.A. Times have a most excellent write-up related to these two events when Roy used his power and influence to keep The Walt Disney Company on course with his uncle and father’s original vision. Roy is survived by his wife, Leslie, and four children from his marriage to Patricia Dailey Disney – Tim Disney, Roy Patrick Disney, Abigail Disney, and Susan Disney Lord. He is also survived by 16 grandchildren.